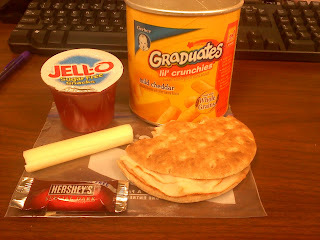 Friday's lunches are usually a hodge podge of whatever I have left in the kitchen. Today was no exception. I had a chicken sandwich, cheese stick, mild cheddar lil'crunchies (best flavor!!! ), sugar free jello and a sugar free hershey's dark chocolate.